Former Texas governor Rick Perry had his confirmation hearing Thursday as President-elect Donald Trump's pick for secretary of energy. He said he no longer wants to get rid of the agency. Even Rick Perry changes his mind. At his confirmation hearing as President-elect Donald Trump's pick for Secretary of Energy, the former Texas governor said he no longer wants to do away with the department he once said should be eliminated. Or, at least, that was something he tried to say. In 2011, during one of his presidential campaign debates, Perry could only remember the names of two of the three agencies he wanted get rid of. The third agency is the very one he was chosen by Trump to head. Perry said at the hearing that he regrets ever suggesting that idea. "My past statements made over five years ago about abolishing the Department of Energy do not reflect my current thinking," Perry said. That was not the only message that differed from his past views. At various times, Perry has questioned the role of human activity in climate change. At one campaign event, he accused scientists of manipulating data to continue gaining funding on research. Today, Perry said he believed both natural and man-made activity were causing the climate to change. "The question is how we address it in a thoughtful way that doesn't compromise economic growth," he said. He was challenged on this statement by Sen. Maria Cantwell, D-Wash.
"I guarantee you today we are compromising economic growth because of our over-dependence on fossil fuel," Cantwell said. She said climate change is hurting her state's economy by intensifying wildfires and hurting the shellfish industry. She also pressed Perry on a questionnaire the Trump administration has circulated through the Department of Energy. It sought the names of employees who attended climate change meetings. Perry said the questionnaire went out before he was nominated. "I didn't approve of it," he said. "I don't approve of it. I don't need that information." Perry's critics also question how Perry will manage the Department of Energy with a lack of scientific background. The agency oversees 17 national laboratories and is charged with keeping the country's nuclear weapons safe. Perry said he learned as governor of Texas how to identify talented people who can help with management. Perry also made no promise when Sen. Catherine Cortez Masto, D-Nev., sought assurance that the Yucca Mountain repository in her state would never be used. "I will not sit here in front of you in a committee hearing and tell you absolutely, no way is Nevada going to be the recipient of high-level waste," he said. The hearing ended on a lighter note with an exchange between Perry and Minnesota Senator Al Franken. "Did you enjoy meeting me?" Franken asked, referring to a conversation he had with Perry before the hearing. "I hope you're as much fun on that dais as you were on the couch," Perry said. Perry asked to rephrase the statement once he saw it could be interpreted differently, changing his mind on something once again. The Energy and Natural Resources Committee has not scheduled a vote on Perry's nomination yet. If senators there approve, Perry's nomination would go to a vote of the full senate. Donald Trump's pick for secretary of energy says he no longer wants to get rid of the department. Former Texas Governor Rick Perry was on Capitol Hill today for his confirmation hearing, as NPR's Jeff Brady reports. JEFF BRADY, BYLINE: Back in 2011, it was an embarrassing moment for Rick Perry during a presidential campaign debate when he couldn't remember the name of the agency he wanted to eliminate. RICK PERRY: And the - what's the third one? Let's see. BRADY: It was the Department of Energy, and today Perry said he regrets ever suggesting that idea. PERRY: My past statements, made over five years ago, about abolishing the Department of Energy do not reflect my current thinking. BRADY: Democrats on the panel grilled Perry about his past statements on climate change. At different times, Perry has questioned whether human activity contributes to climate change. At one campaign event, he accused scientists of manipulating data so their research funding stream would continue to flow. Today, again, his message was different. PERRY: I believe the climate has changed. I believe some of it is naturally occurring, but some of it is caused by manmade activity. The question is how we address it in a thoughtful way that doesn't compromise economic growth. BRADY: The ranking Democrat on the committee, Senator Maria Cantwell from Washington state, challenged the second half of that statement. MARIA CANTWELL: I guarantee you today we're compromising economic growth because of our overdependence on fossil fuel. BRADY: Cantwell told Perry climate change is hurting her state's economy. It makes wildfires more intense and hurts the shellfish industry. Cantwell also pressed Perry on a questionnaire that the Trump transition team circulated through the Department of Energy. It sought the names of employees who attended climate change meetings. Current energy secretary Ernest Moniz refused the request. Perry said that questionnaire went out before he was nominated. PERRY: I didn't approve it. I don't approve of it. I don't need that information. I don't want that information. That is not how I manage. 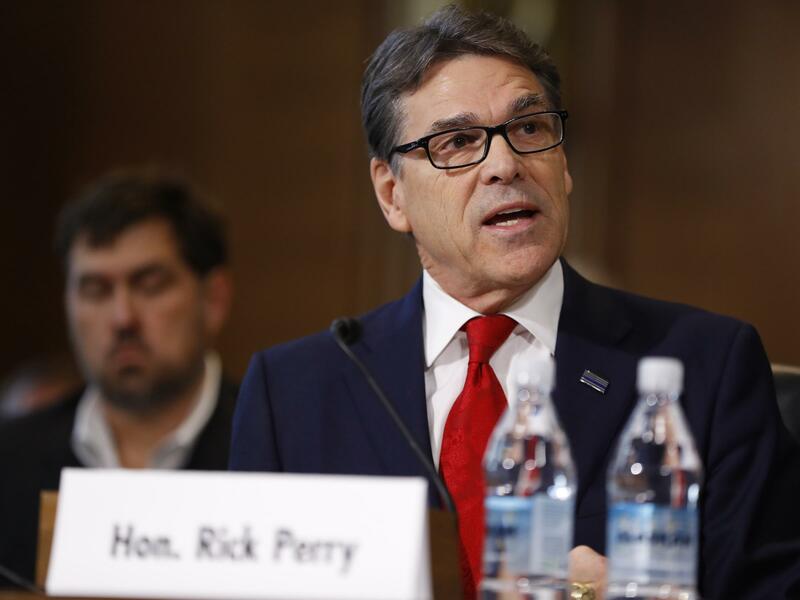 BRADY: How Perry will manage the Department of Energy is a key question for his critics. He's not a scientist, and science is a big part of what the agency does. It oversees 17 national laboratories and is charged with keeping the country's nuclear weapons safe. Perry said as governor of Texas, he learned how to identify talented people who can help him manage agencies. On renewable energy, Perry said if confirmed he'll support and promote all kinds of energy. He reminded senators that Texas became the number one wind energy producer while he was governor. How to handle nuclear waste from power plants was another big issue. Nevada Senator Catherine Cortez Masto sought assurance that the Yucca Mountain repository in her state would never be used, but Perry made no promise. PERRY: I will not sit here in front of you in a committee hearing and tell you absolutely no way is Nevada going to be the recipient of any high-level waste. BRADY: There was a moment of levity when Minnesota Senator Al Franken referred to a conversation he had with Perry before the hearing. AL FRANKEN: Did you enjoy meeting me? PERRY: I hope you are as much fun on that dais as you are on your couch. PERRY: May I rephrase that, sir? BRADY: The Energy and Natural Resources Committee has not scheduled a vote on Perry's nomination yet. If senators there approve, Perry's nomination would go to a vote of the full Senate. Jeff Brady, NPR News. Transcript provided by NPR, Copyright NPR.